With the flagship of the iProo Voice notification system, you can now be in the loop of pertinent notifications about your virtual engagement on iProo. 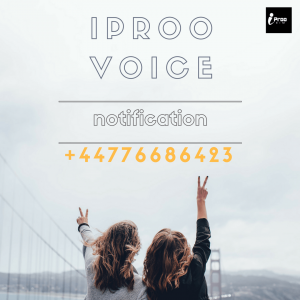 Kindly note that the one-way mobile voice connectivity route couched for the iProo Voice notification system is +4(iProoVoice)/+44776686423. Should you miss a call from our voice notification system, please send an email to tech.support@iproo.net to confirm the update intended to be communicated to you.